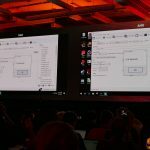 I am reporting from an official AMD Ryzen event, getting the inside information directly from AMD themselves – you will be pleased to hear, no more rumours or leaks. 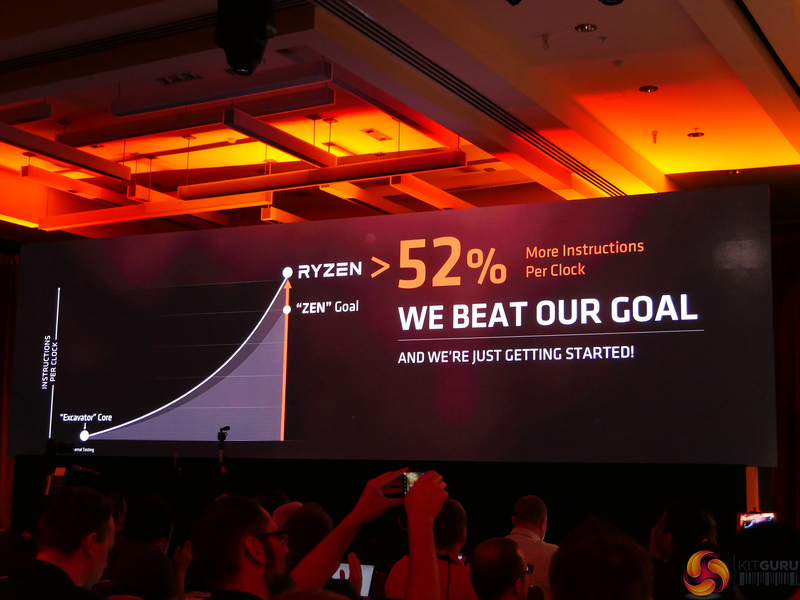 Today is the day that many PC enthusiasts have been waiting patiently for – AMD has officially announced that their new Zen-based Ryzen processors will be available to pre-order starting February 22nd and will be shipped on March 2nd. 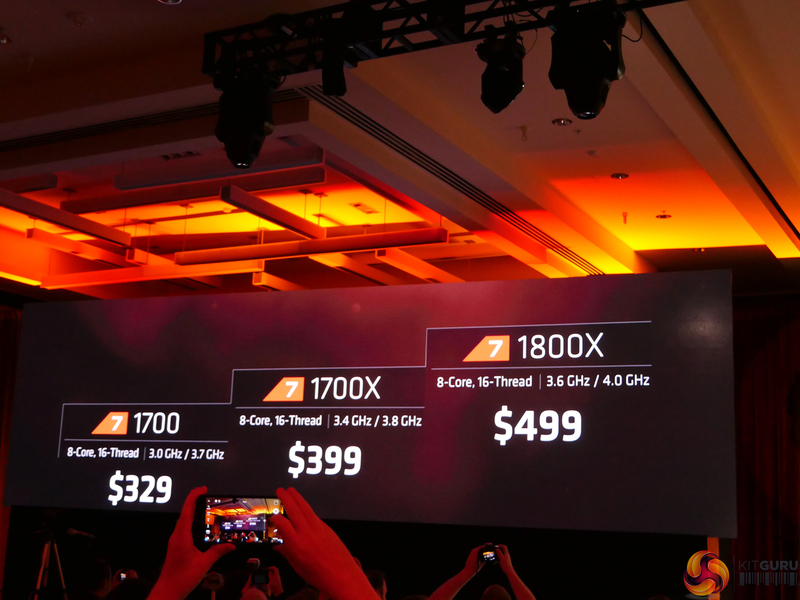 Ryzen 7 brings to the table eight cores, sixteen threads, frequencies pushing through 4GHz, TDPs below 100W, and pricing ranging from $329 to $499 (~£320 to £490). 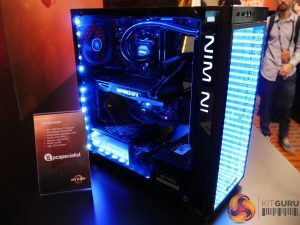 In Ryzen 7, AMD’s return to the high-performance consumer CPU market looks set to be a highly disruptive one that could deal a significant sucker punch to its primary competitor. 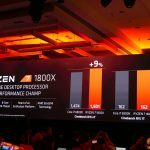 AMD started the Zen design from scratch 4 years ago and set the goal of a 40% Instruction Per Clock (IPC) performance increase over Excavator. 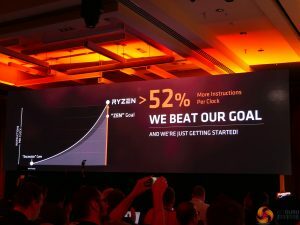 That figure turned out to be different to the performance improvement that AMD is actually quoting, which now stands at 52%. Over-achievement and higher-than-expected IPC boosts in the desktop CPU market are something that us enthusiasts have been starved of with recent releases from both chip vendors. According to AMD, the performance improvement is a combination of the 2 million engineering hours put into the chip’s design as well as the onus being put on creating an architecture that scales from consumer PC applications to the datacentre. The result is a 4.8 Billion transistor chip fabbed on a 14nm process with over 2000 metres of signal wiring, in addition to the Ryzen logo etched onto its heatspreader. 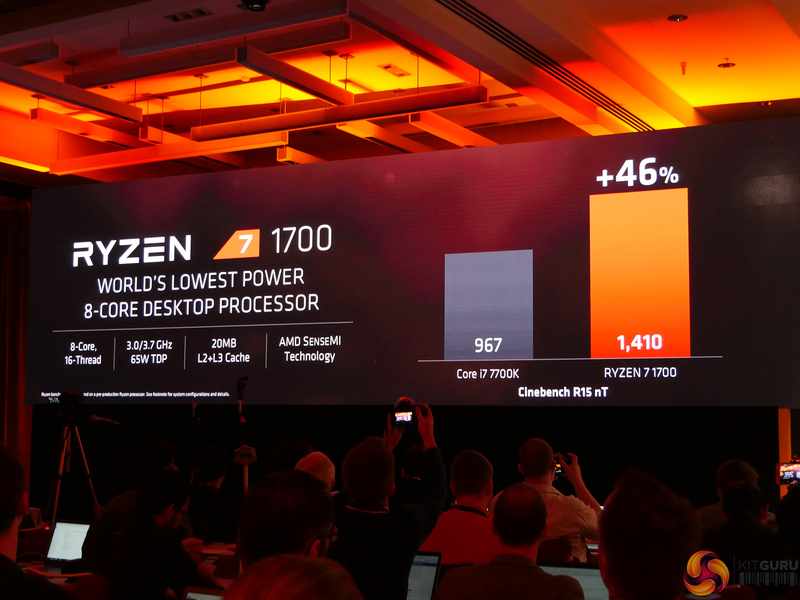 Ryzen 7 1800X – 8 cores, 16 threads, 3.6GHz base speed, 4.0GHz boost speed, 4.1GHz maximum XFR speed, 95W TDP, $499 USD, £489.95 OCUK price. Ryzen 7 1700X – 8 cores, 16 threads, 3.4GHz base speed, 3.8GHz boost speed, XFR support, 95W TDP, $399 USD, £379.99 OCUK price. Ryzen 7 1700 – 8 cores, 16 threads, 3.0GHz base speed, 3.7GHz boost speed, no XFR support, 65W TDP, $329 USD, £319.99 OCUK price. Update 22/02/17 17:10 GMT: Overclockers UK has confirmed Ryzen 7 pre-order pricing which we discuss HERE. 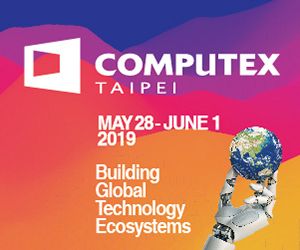 That ‘X’ prefix denotes support for eXtended Frequency Range (XFR) which allows a number of the CPU’s cores to operate at up to 1 multiplier bin higher if thermal and power threshold budgets are not saturated. 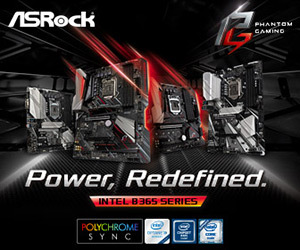 The main difference between the 1700X and 1800X is related to operating frequency. 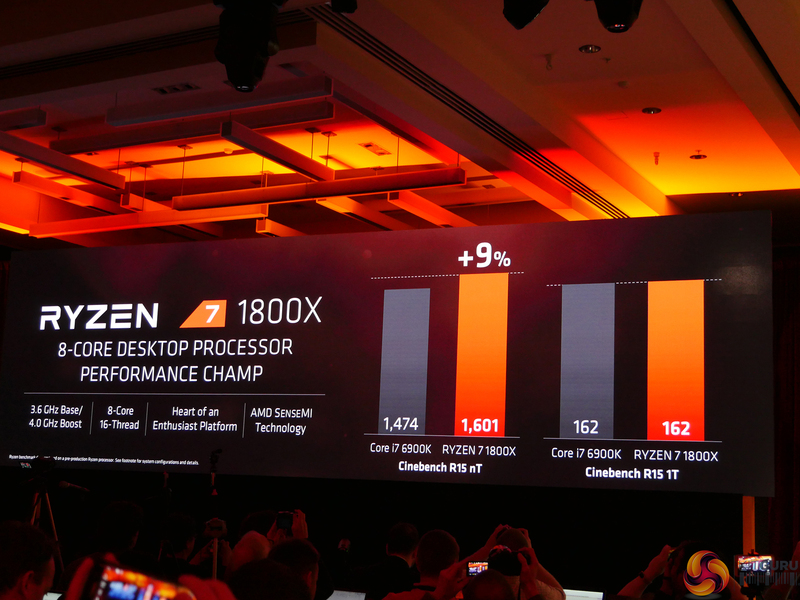 The 1800X is essentially a cherry-picked chip that fits a more desirable voltage-frequency curve and can be expected to overclock higher than its 1700X counterpart. AMD’s SenseMI is used on all Ryzen 7 CPUs and the entire Ryzen product stack has unlocked multipliers that can be utilised with the correct motherboard. 20MB of L2+L3 cache is available. Now for the performance numbers shown by AMD. These numbers are using systems chosen and built by AMD and should therefore be interpreted with an element of caution before third party test data is available. However, many of the demos were shown in real time and I had chance to validate and run some of the demo benchmarks myself using systems in AMD’s showcase room. To put it simply, the 8C16T, 3.6/4.0GHz, 95W TDP Ryzen 7 1800X manages to beat the 8C16T, 3.2/3.7GHz, 140W TDP Core i7-6900K in Cinebench multi-threaded performance. Furthermore, both CPUs are roughly equal in terms of Cinebench single-threaded performance (which puts Skylake architecture at an estimated 5-10% higher IPC performance than Zen). That $499 Ryzen 7 CPU can hang with, and outperform, an Intel chip more than twice its price. Handbrake transcoding was also 10 seconds (around 14%) faster on the AMD chip when using AMD’s video file and conversion settings. AMD also ran Sniper Elite 4 at 4K and showed performance to be similar between the Broadwell-E chip and AMD’s Ryzen part. Based on Handbrake and Cinebench results, AMD is saying that Ryzen 7 1800X is the fastest 8-core desktop CPU on the market. The $399 Ryzen 7 1700X takes on the $425 Intel Core i7-6800K and manages to beat in Cinebench multi-threaded by more than 35% in AMD’s test. Moving down to the cheapest Ryzen 7 chip, the $329 1700 is significantly faster than a comparable $350 Core i7-7700K in multi-threaded applications such as Cinebench rendering. Just to reiterate the performance numbers being shown off by AMD, a $499 CPU is outperforming Intel’s second-fastest consumer chip at less than half the price. 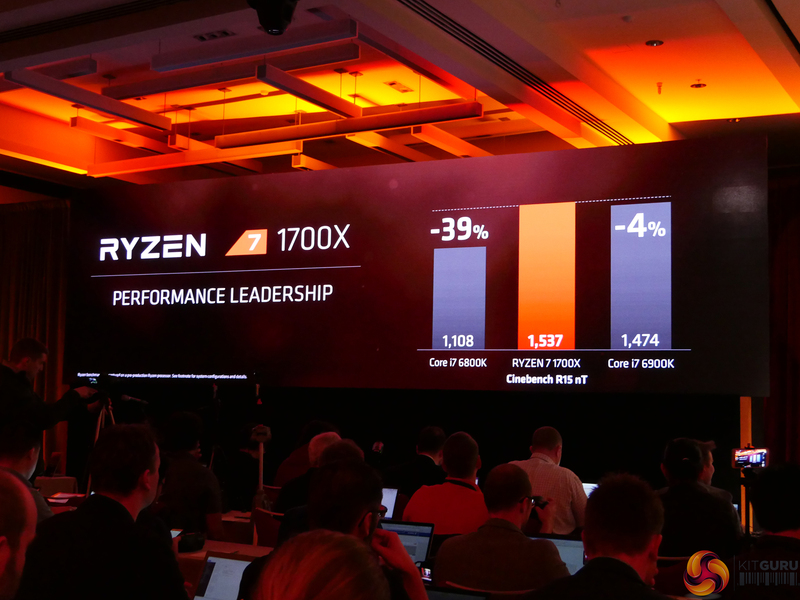 The $399 Ryzen 7 1700X is faster than Intel’s competing 6C12T Core i7-6800K option, and the 65W TDP Ryzen 7 1700 at $329 outperforms Core i7-7700K in multi-threaded workloads (though single-threaded performance at the level of Skylake architecture is very unlikely from the current generation of Zen micro-architecture). 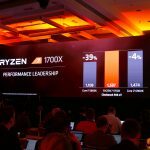 These points emphasise the suggestion of Ryzen causing disruption in the marketplace. System integrators such as Overclockers UK and PC Specialist will have Ryzen-powered systems available from the March 2nd launch day, as will a double-digit number of other system builders (worldwide). 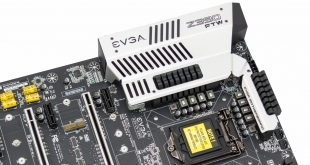 More than 82 AM4-platform motherboards will be available on launch from the likes of ASRock, ASUS, Biostar, Gigabyte, and MSI (though there was no sign of any mini-ITX motherboards). 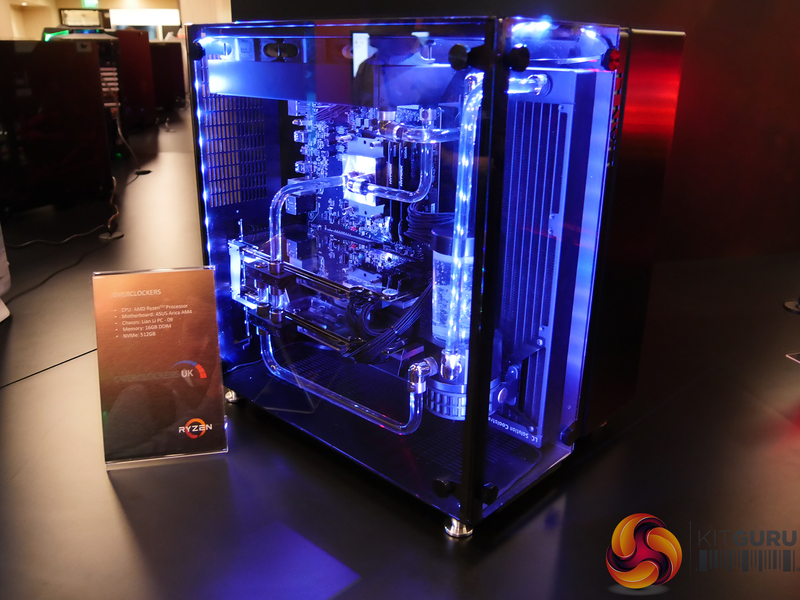 AMD will also be launching the new Wraith coolers which include an RGB-equipped flagship part designed to handle the 95W TDP Ryzen CPUs that system integrators can purchase (but not end-users). 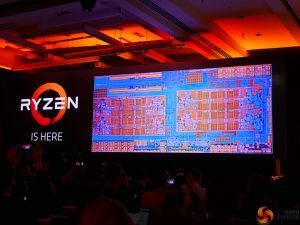 Ryzen 7 is 8 cores, 16 threads for the 3 SKUs. 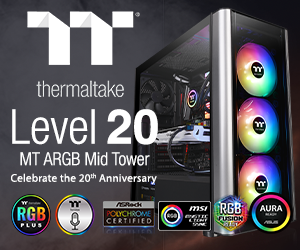 Rated clock speeds range across the 3GHz spectrum and push into 4.1GHz for the flagship 1800X. 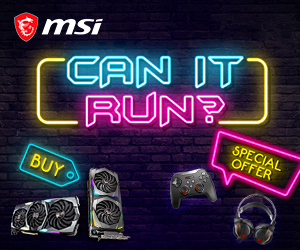 Pricing is significantly lower than performance-comparable Intel chips, based on AMD’s performance numbers – Ryzen 7 1800X (3.6/4.0GHz, XFR) is $499, Ryzen 7 1700X (3.4/3.8GHz, XFR) is $399, Ryzen 7 1700 (3.0/3.7GHz, 65W TDP) is $329. Pre-orders start February 22nd 6PM UK time with the official release date being March 2nd (likely to be March 3rd delivery date for pre-orders). The new RGB AMD Wraith cooler will be bundled with Ryzen chips (but not all SKUs and not the highest-end ones). 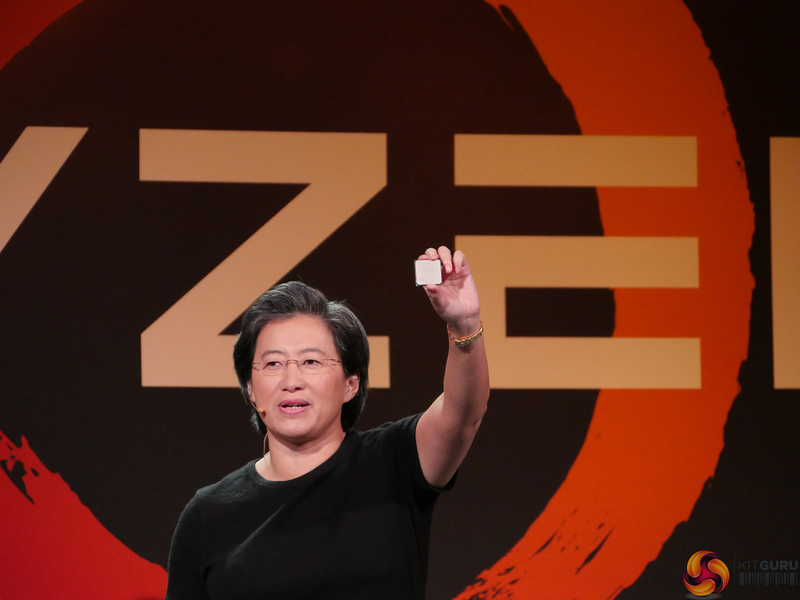 AMD CEO, Dr Lisa Su, said that the team “could not be more proud of Ryzen”. 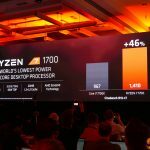 AMD has shown a large amount of positive data and performance metrics for Ryzen. And with lower core count and mobile Ryzen chips launching later this year, AMD is not taking its foot off the gas. Our March 2nd review will show how Ryzen 7 performs against Intel’s competitors in a wide range of benchmarks and usage scenarios. KitGuru Says: A promising indication of Ryzen performance has been shown by AMD. Are you waiting eagerly for third-party test results to find out exactly how the CPU performs? KitGuru will be here very soon to show you real world performance.